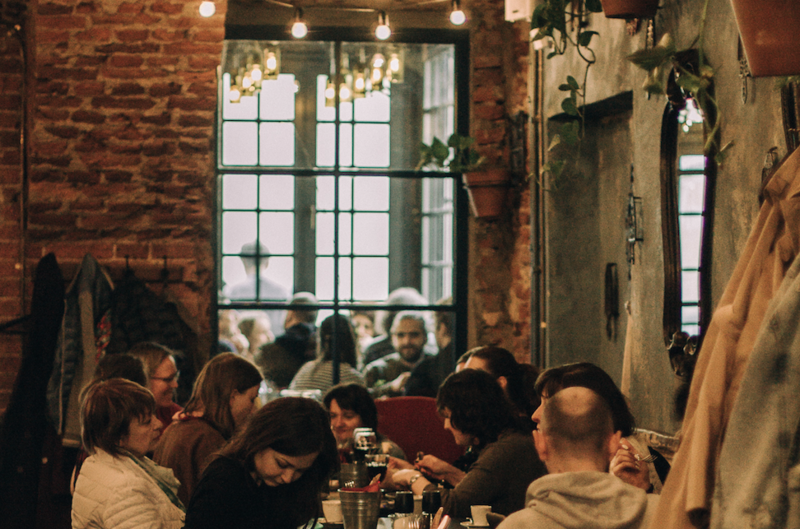 Whether you’re looking to try some Russian classics or expand your global gastronomic horizons, St Petersburg is home to a plethora of restaurants and cafes that will shatter any lingering stereotypes about eating in Russia. From Middle Eastern street food to the best local tipple, our run down of St Petersburg food and drink hotspots will make sure you don’t miss out on a single morsel. Cheering on your World Cup team is hungry work, after all. Literary chic meets bread at Vasilyevsky Island’s Buterbrodsky. A pun on the name of Russian poet Joseph Brodsky and buterbrod (meaning sandwich in Russian), Buterbrodsky draws a young, stylish crowd who come to enjoy the house specialities: an eclectic selection of open sandwiches and homemade fruit-infused spirits. If a smørrebrød topped with roast beef, chanterelles and pickles or salmon and fresh, peppery radish don’t tickle your fancy, a number of delicious other options are on offer, such as delicate oladi (courgette pancakes) and salads jam-packed with fresh flavours. In any case, be sure to wash down your food with one of Buterbrodsky’s nastoiki infusions: will it be a cherry bourbon, or perhaps a smoked pear rum? Don’t be alarmed when you look up to see Brodsky himself staring down at the sandwiches – his portraits only serve to enhance the shabby-chic and quietly eccentric vibe that abounds inside this historic building. “It's so fluffy, I'm gonna die!” may be a quote-turned-viral-sensation originating from the movie Despicable Me, but it is also a shout often heard coming from inside St Petersburg’s Bao by Umao. Imagine biting into a pillowy soft steamed bao bun, filled with tender duck in hoisin sauce or tangy kimchi with forest mushrooms, followed by sweet banana tempura with zesty chilli and passion fruit sauce… we’re drooling just thinking about it. The dough-centred outpost of elegant pan-Asian restaurant Umao, Bao by Umao also serves up delicious Thai-style tom yum soups and dainty dim sum, all in effortlessly stylish surroundings on Lomonosova Street. If you were to stumble upon Bekitzer, you could be forgiven for thinking you’d made a wrong turn and somehow ended up in a trendy Tel Aviv eatery. With its flagship set on buzzing Rubinstein Street, arguably St Petersburg’s ultimate foodie destination, Bekitzer is now serving up Israeli street food at locations in New Holland and off the St Petersburg ring road at the 117 Kilometre building. Inspired by the local Jewish community’s passion for good food, Bekitzer offers a selection of meze plates, pitas and desserts: we particularly recommend the Sabih pita, packed with aubergine, hummus, tahini and egg, paired with a glass of Israeli wine. For those less than familiar with the likes of tahini, harissa and babaganoush, fear not: a handy glossary is provided to ensure a smooth ordering process. Hidden away in an unassuming courtyard off Gorokhovaya Street, Co-op Garage is a pizza joint worth asking directions for. Industrial furnishings and a rock soundtrack provide the backdrop to enjoying Co-op Garage’s innovative menu, where you’ll be hard pushed to find something as normcore as a ham and pineapple-adorned Hawaiian: duck confit with rocket, bratwurst and spinach, and salmon with quail eggs are just a few of the variants up for grabs. On sunny evenings the outside tables provide the perfect spot for catching up over a cider or engaging in some people watching with a pint of the latest guest brew while, alternatively, the house pool table always promises to be abuzz with competition. When you imagined visiting Russia, you might well have had visions of knocking back vodka, probably knee-deep in snow and all the while wearing an impressive fur-lined hat. You provide the hat (and visit in the winter for the best chance of snow) and Mayak will provide the tipple experience you’ve long craved. Serving up borscht and nostalgia in equal doses, Mayak opened in 1993 but manages to conjure a sense of the Soviet era: busts and portraits of Lenin, Dzerzhinsky and Marx sit against dark wood panelling, as uniformed waitresses deliver hard-boiled eggs with red caviar to a diverse clientele. At this humble yet charming ryumochnaya (traditional Soviet-era vodka bar), you can enjoy a shot of the good stuff for next to nothing – the big question is, will you dare to pair it with some beef tongue in aspic? In any case, embrace the cliche, and spend some time getting to know a very Soviet watering hole. Something of a St Petersburg institution, Khroniki combines contemporary Scandi style with the charm of an old school Soviet ryumochnaya. This buzzing drinking spot, which features on any decent St Petersburg bar hopping itinerary, specialises in the hard stuff, with a plethora of tasty tipples awaiting from Russia, Sweden, Finland and Denmark. For those looking for a gentler approach, the house’s signature cocktail – Free Ingria, which features cloudberry liqueur, apple juice, cranberry and bitters – is a welcome and delicious alternative. The minimalist interior, with its white tiles and antique chandeliers, somehow manages to be both edgy and cosy, while guest DJs set an upbeat tone. This backdrop sets the scene for some stellar chat from the bar’s fascinating crowd; co-founded by online magazine The Village‘s local editor Pyotr Birger, Khroniki draws in journalists, writers, philosophers and actors. Join them for a taste of both life among the city’s creative intelligentsia and some tantalising marinated herring. Juicy khinkali dumplings, gooey cheese-stuffed khachapuri… need we say more? Nestled within Golitsyn Loft – a vast creative cluster spanning five buildings, encompassing cafes, galleries, hairdressers, shops and a theatre on the Fontanka River – Kazbegi welcomes diners to try sumptuous Georgian classics in stylish gastropub-esque surroundings. The house speciality is khinkali – substantial dumpling parcels filled with traditional meat, veggies or suluguni cheese and potato – while also on the menu are khachapuri bread stuffed with lobio beans or spinach, aubergine rolls and satsivi chicken in walnut sauce. Swoon. Set in a former garage, Kazbegi dishes up these Georgian delights among spectacular arched vaults, exposed brickwork and vintage furniture. Russian poet Alexander Pushkin once commented that “every Georgian dish is a poem” – as with all good poetry, these poems are best paired with a delicious local wine. As luck would have it, Kazbegi is home to a real wine cellar. Fast becoming a must-see destination for any visit to St Petersburg, New Holland is not only home to a lush green park and contemporary art, but also to a vibrant food scene. For those who get peckish while exploring the numerous pavilions or playing frisbee on the lawn, some welcome sustenance can be found on the first floor of the distinctive round building named “the Bottle” (Butilka). Here you can feast on an indulgent American Star burger (complete with cheddar, bbq sauce, paprika and cucumber relish) at Ferma Burger, slurp Vietnamese soup and crunch on spring rolls at Pho'n'Roll, and experience Japanese-California fusion at Ronny or a New York pastrami sandwich at Dikman’s Deli. Your caffeine fix comes courtesy of the kings of cool at Surf Coffee, while something stronger is on offer at New Holland’s very own ryumochnaya. Should you accidentally overindulge, the third floor of the Bottle is a hub for all things health and beauty: attend a spinning class, go boxing or, alternatively, just have a manicure.